After a raft of critical reviews and user feedback reporting of tardy AF, Canon’s first mirrorless camera hasn’t been quite the success the firm envisaged. 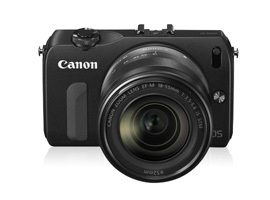 Nevertheless, Canon has since released new firmware enhancing the camera’s AF performance while at the same time dramatically lowering the price. 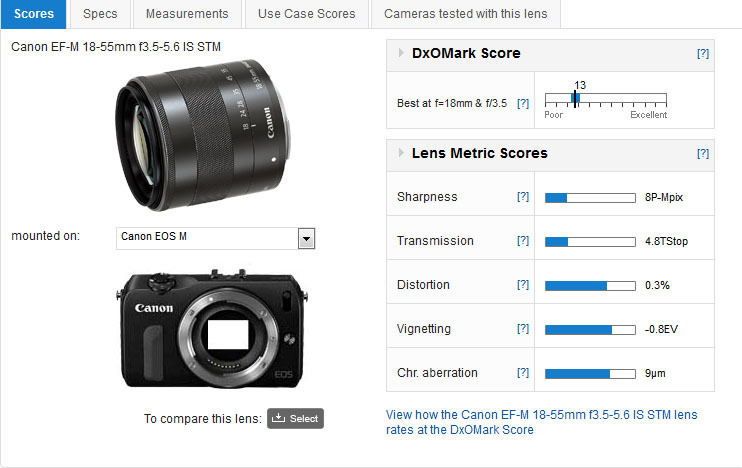 As a result, the EOS-M is now a much more convincing option than it was at the time of its launch. Canon has yet to divulge a road map and so the strategy for cameras and lenses remains unclear, a fact not helped by the small group of lenses available (just three, including one prime). However, the $139 EF-EOS M mount adaptor allows the firm’s EF and EF-S lenses to be used without restrictions, making the tiny camera a more viable option for existing Canon DSLR users. The one zoom announced at the launch, the 18-55mm f/3.5-5.6 IS STM is stabilized and adopts the firm’s new stepper motor technology for smooth and near silent autofocus during video. The optical formula consists of 13 elements in 11 groups, focuses to 0.25m and is priced separately at $269. 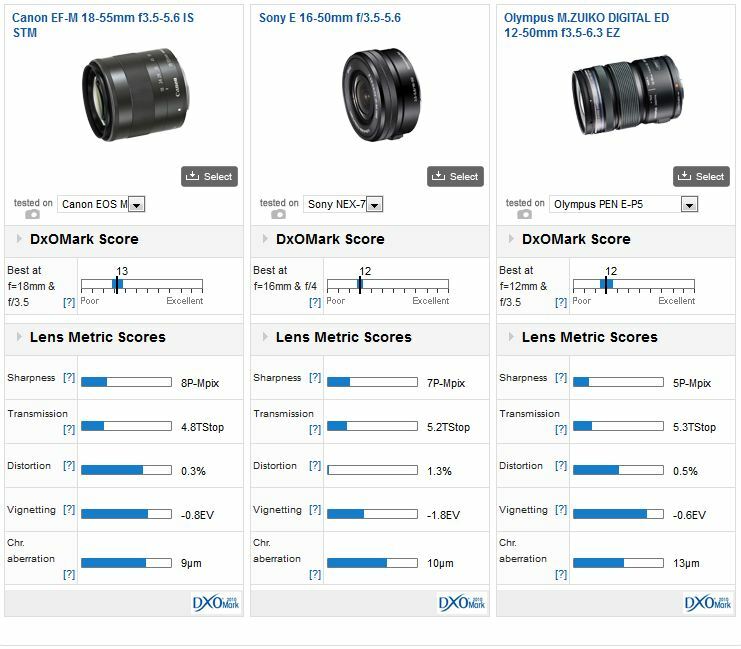 This is the fist lens we’ve analyzed for the EOS-M mount, and with an overall DxOMark lens score of 13 points it’s rather good optically. Distortion, vignetting and chromatic aberration are all well controlled and sharpness is quite high for a budget lens but falls well short of a high-grade (and much more pricey) lens like the Sigma 18-35mm f/1.8. With Canon now offering two APS-C systems, with the new ultra small EOS 100D DSLR targeting mirrorless cameras, the EF-M 18-55mm has a direct competitor in its own camp. Comparing the two reveals that the EF-M version performs very similarly to the slightly cheaper ($249) EF-S variant. When we compare the EF-M model to rival offerings, the optical performance is on a par with the best kit lens from Sony for NEX series cameras. Even though the E 16-50mm f3.5-5.6 offers a wider angle of view (it’s the equivalent of a 24-75mm) that compromises optical performance somewhat, bear in mind it’s around $100 more expensive. 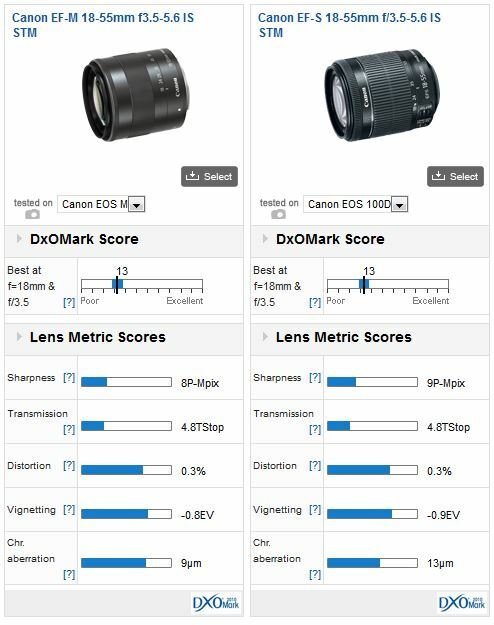 Although, not a direct comparison based on sensor size, the Canon comfortably outperforms the $499 Olympus 12-50mm f/3.5-5.6 EZ lens, which is bundled with the maker’s high-end OM-D E-M5 model. 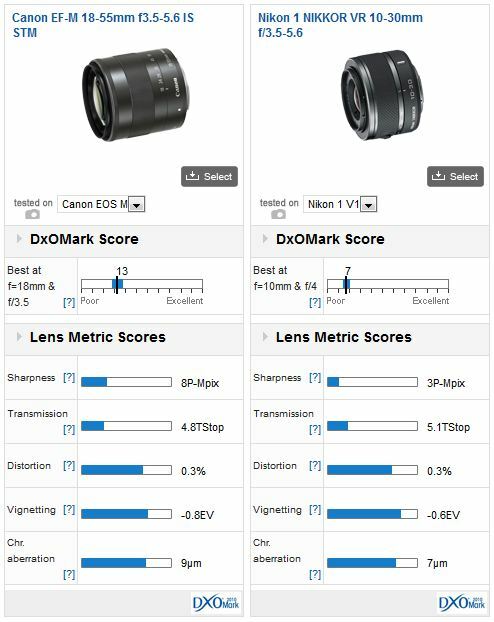 Although it has other benefits, it’s not a great performer optically (for further comparisons of MFT standard zooms, please follow the link here). We couldn’t help comparing the Canon lens with the Nikon 1 Nikkor VR 10-30mm (28-80mm equivalent). Ironically, the tiny Nikon 1 system is known for its impressively fast AF (with the Nikon cameras adopting on-chip PDAF). While this lens is also stabilized it’s accessibly priced at $186, and is frequently found as kit lens for the various Nikon 1 bodies. While most aberrations are well controlled it has disappointing sharpness, even when measured on a body with a relatively low pixel count (in this instance the 10Mpix Nikon 1 V1). Canon’s prowess as a lens maker is just one of the attractions of the EOS-M system, however the firm seem reluctant to expand the system to appeal to enthusiasts. Be that as it may, with the price for EOS-M body complete with this lens now at just $345, compared with $899 at launch, it’s quite a tempting proposition.